Recently, in the workshop built by Inner Mongolia Yijiahong Mushroom Co., LTD, workers are engaged with routine mushroom production task. Baiyin Tarasumu covers 722,000 mu of gross area, of which sand area occupies 609,000 mu. 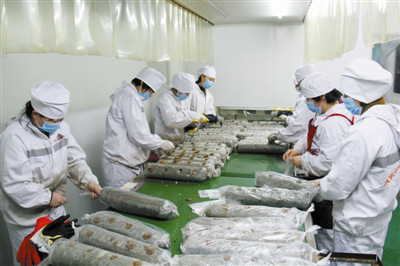 Over the years, Baiyin Tarasumu positively adjusts economic structure and strengthens leading mushroom industry. Inner Mongolia Yijiahong Mushroom Co., LTD takes up 80 mu of gross area, by now, it has set up 4 mushroom bases and 140 mushroom greenhouses. Nowadays, daily output on mushroom nutrient bags reaches 18,000, pure profits on each bag hit 1.5 CNY or so, mushrooms produced in the company are mainly exported to Korea, Japan, America and other oversea nations while deep-processed mushroom products such as Mushroom Sauce and Mushroom Beverage are sold well in Beijing, Shanghai, Guangzhou and other large cities in China.